Lamb stew recipe: Fårikål or Couscous? It’s interesting to see how shops in Oslo offer produces based on the season. A month ago I was craving lamb. The butcher at the grocery said: it’s raining, the wool is not wet so we can’t shave the lambs so I haven’t received any. 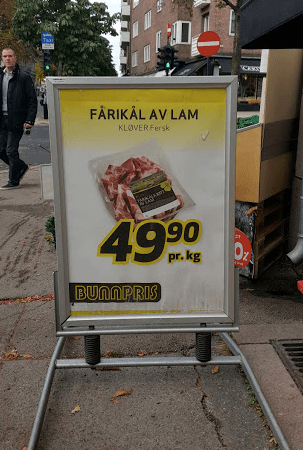 This month is cheap lamb month and the seasonal dish is Farikål. Farikål is a stew with lamb and cabbage, some peppercorn, juniper bays and potatoes*. I was very keen to try but then some friends said it was quite blend and I also remembered that my kids don’t like cabbage. So if I have to spend 3 hours in the kitchen, I might as well do something the family can eat… several days in a row even! That’s 5.5 euros a kilo. Cheap! So here is my recipe, inspired from one of the French cuisine bible: Cuisine sans souci by Rose Montigny, page 703, but with a lot less oil, no turnip nor chickpeas. Feel free to add them to taste. I also add a cube of chicken stock and one of beef stock. 10 min before you eat, prepare the couscous semolina by adding double the amount of salted water and let it swell, then add the butter in the couscous. I also use the stew sauce to give it a bit of flavour. 5 minutes before you eat, chop the zucchinis and add them into the pot. By then the meat should be very tender and infused with the fat. Yum! Bon appetit! *FUN FACT: I discovered that in Norwegian, a potato is also an employee that can do a bit of everything… because in Norwegian cuisine you can use potato for everything! Love it!! !